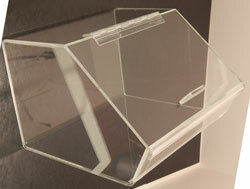 This is an acrylic knife display stand. This display is very simple in design but equally as functional. The One piece design is very durable and stable. This item will not occupy too much counter space. The flame polished edges give a clean and smooth finish.